As far as I know UaDreams have several different ways to pay for their services. As a last resort, if John hold so dear his so long correspondence with his beloved girl, why didn’t he use an alternative payment method? 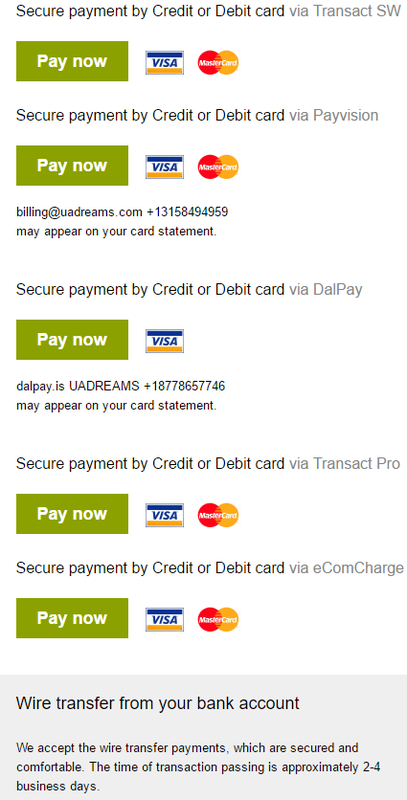 It isn’t clear how UaDreams comes into the picture when Visa refused to transfer payments from the card? Is it scams from UaDreams side? And if Visa refused from John’s payments – perhaps the world’s most popular payment service provider considered his card or bank account to be fraudulent. And where are evidences that namely John paid from John’s card? Hm.. it is incredible, the agency that profits off of this, refused to take money for a trip service? Moreover, it doesn’t sound impressive – correspondence with a girl from Germany registered on a Ukrainian dating site. This review confuses. How is that? UaDreams arranges meetings of its members only on the territory of Ukraine, as far as I know. Really, it would be deplorable, if UaDreams, being the third part in the relationships between men and women, wouldn’t worry about their finances. What would it lead to? Would they remain the same UaDreams, a worldwide popular matchmaking agency or… turned into a place for scammers?